12 Clover Day's game ver. 24 a memories for us feat. 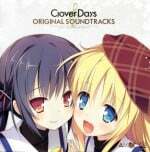 "Day's"
1 Clover Heart's -New days recording- game ver. 16 Clover Day's full ver. 17 Clover Day's off vocal ver. 18 Clover Heart's -New days recording- full ver. 19 Clover Heart's -New days recording- off vocal ver.